For most of her life Mary Bennet has been an object of ridicule. With a notable absence of the social graces, she has been an embarrassment to her family on more than one occasion. But lately, Mary has changed. She's matured and attained a respectable, if somewhat unpolished, decorum. But her peace and contentment are shattered when her sister Lydia turns up-very pregnant and separated from Wickham. Mary and Kitty are bustled off to stay with Jane and her husband. It is there that Mary meets Henry Walsh, whose attentions confound her. Unschooled in the game of love, her heart and her future are at risk. Is she worthy of love or should she take the safer path? In her journey of self-acceptance, she discovers the answer. It is a truth universally acknowledged that I am a Jane Austen fan. Too much? If you take a close look at the reviews here on Novel Escapes you’ll see that I’m behind most (if not all) the reviews of Jane Austen-esque books. And I love it! This time around I got to review The Pursuit of Mary Bennet: A Pride & Prejudice Novel by Pamela Mingle. I was a little hesitant because Mary is the Bennet sister that everyone forgets about and I didn’t know if she could hold her own as a heroine. Turns out she can. I didn’t want to put this novel down! So why, if I loved this book so much, did I only give it four stars? It was because of the language and the mimicking of Jane Austen that Mingle had to do. No one can ever sound exactly like Austen and I know that. What gets to me is when I can notice that the language and tone doesn’t quite suit. Some authors can pull it off and I don’t think twice about them speaking in Austen’s voice but there was something about the way this novel was written that just didn’t quite flow for me. It wasn’t bad by any means and I’m probably thinking too much about it. There were also a few scenes and descriptions that I wasn’t sure would be discussed in a novel during Austen’s time, especially the emotional and romance heavy scenes. There was also the fact that Elizabeth, affectionately known as Lizzie in the original novel, was actually called Lizzy. I know it sounds the same but it’s still not correct. My hope is that it was corrected in the final version of the novel (I was reading an advanced ecopy). Overall though, I think Mingle did a good job of continuing Austen’s most well known novel. Continuing on that line, I thought the directions Mingle took the characters in were completely bang on. No one started acting in a way that had me confused and all of their actions made sense from what I knew from Pride and Prejudice. I loved that. I’ve read other books that take the characters and have them act in a, well, uncharacteristic way. I was so glad Mingle didn’t do that. I adored her Pride and Prejudice characters. And the direction she took the story! Poor Mary is often forgotten about (that fact is actually referenced in one episode of the popular vlog The Lizzie Bennet Diaries) so I loved being able to see what could have happened to her after P&P. The story as a whole was an interesting one. Elizabeth actually doesn’t feature too much in the book, and I think I liked that. As much as I, and everyone else, loved her in Pride and Prejudice, it was nice to get the perspectives of the other sisters. I really liked seeing Jane as a wife and mother and it was great to see Kitty grow up and finally get away from Lydia’s influence. There was scandal, drama, and husband hunting (intentional or not) and it all worked together to create a great story. I think The Pursuit of Mary Bennet is a novel that all Jane Austen fans should check out. 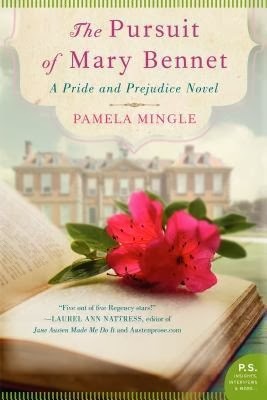 Pamela Mingle did a great job of capturing the essence and heart of Austen’s beloved novel Pride and Prejudice. Another sure sign that I loved it, and think you will too: I couldn’t stop thinking about this novel when I wasn’t reading it! If you’re looking for a wonderful Pride and Prejudice companion novel I don’t think you can go wrong with this one.